Hi everyone, been too busy enjoying the lovely weather here to have done much crafting but I have managed a few new designs and also a freebie card for you. This is the freebie and if you don't want to make the actual card you could just use the sentiment or the cake with the candles on their own. The links for the downloads are at the end of this post. The download links for the Make A Wish freebie card are below. Would appreciate you leaving a comment if you download the files, otherwise I don't know if it's worth my time and effort posting them. Many thanks to my regular followers who take the time to do so. I agree with Claudia, it is worth your time. I always look forward to your freebies and thank you very much. Your files always cut so easily and clean and I just love them. 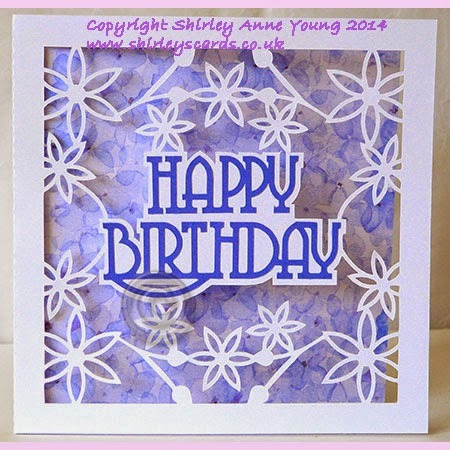 Beautiful designs and cards Shirley. You inspire so many of us that it truly is worth your time. Thank you so much for sharing your talent with us. Your cards are amazing!!!! Thank you for the lovely files. Thanks so much for the make a wish cut file! I need to make a whole stack of birthday cards and this is a good one! Thank you for the file! Birthday cards are my most needed card for family and friends, and this one is a really great design. Thanks so much for sharing! lovely card. thanks for your continued generosity of providing us with your beautiful files. Thank you for the download Shirley, very useful design. Love that BD card. The flowers and the typeface work so well together! This is a great b'day card- thank you so much! Muchisimas gracias, son hermosos los archivos y claro que sonde gran utilidad para muchas de nosotros que no sabemos mucho como hacerlos!!! just DLed. Thanks. Will be sure to link togo if i use it in a blog post. Thank you so much for sharing your files. Just luv your designs! I came across your site by chance. It's amazing, how many really amazing files you provide for people you don't even know. Thank you so much for sharing. It's much appreciated. Thank you so much for sharing your files.